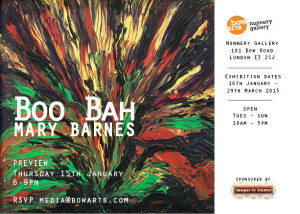 The Nunnery Gallery at Bow is currently showing paintings and drawings by Mary Barnes. Barnes took an unusual route to becoming an artist: most of the works on show were created whilst Barnes was a resident at Kingsley Hall, an experimental therapeutic community founded by counter-cultural psychiatrist R.D. Laing. On her death, Barnes bequeathed much of her collection to her therapist and friend, Dr Joseph Berke, and her nickname for him: “Boo-Bah” is the title of the show. This is the first major show of her works since the 2010 retrospective at SPACE Studios. Born in 1923, Barnes joined the British Army during World War II and subsequently worked as a nurse in Frankfurt and London. She suffered her first breakdown in 1952 and was diagnosed with Schizophrenia. She contacted Laing in 1963, after reading his seminal book “The Divided Self”. She felt that Laing could help her and her brother Peter who was also diagnosed with the same disorder. Initially, she saw Laing for regular session. Then between 1965 and 1970, she became a patient of Berke and joined Kingsley Hall, a patient-centred, non-institutional and non-interventionist therapeutic community. In Kingsley Hall, she was encouraged to regress to an infantile like state; she squealed, refused to dress or wash, was fed from a bottle and slept naked in a wooden chest. Around the same time, Mary started to paint the walls with her own faeces. “My first paintings were black breasts over the walls of the Hall”, recalled Mary in 1969. Then one day, “Joe gave me a tin of grease crayons. ‘Here, just scribble’. I did, on and on. Suddenly, a picture emerged, a woman kneeling with a baby to her breast”. From the crayon scribbles, she developed finger-painting and vivid oil paintings. It is these paintings that are now on view at the Nunnery Gallery. This exhibition is a wonderful exhibition of Mary Barnes’ creative outputs at Kingsley Hall.